Once you have learned to consistently complete basic maneuvers in surfing you can expand your horizons by learning new maneuvers, such as the frontside air reverse. Air reverses are my favourite move in surfing, and are also one of the hardest to learn. They involve a 270° rotation in the air to a backwards landing where your fins will catch and spin you into a full 360°. When dropping into the wave, you need to stay between the middle and the top of the wave to gain as much speed as possible. Speed and timing are the most important things for this trick. Look ahead for a steep section that is just about to break. It is easiest to do this trick on a closeout, but you can do them on steep open-faced waves too. When you find the section approach it the same way you would a frontside straight air. From the middle of the wave bottom turn up the face gradually, projecting your board at a 30° to 45° angle off of the curling lip. Make sure to conserve your speed through the bottom turn. Keep your eyes focused on the part of the lip you are about to launch off. Stay low through your bottom turn, and aim for the steepest part of the lip. Just before you leave the lip your shoulders and upper body should be twisting into the spin. This will initiate your spin, and put you in a good position while in the air. Follow your back foot, through the air as you push the tail of your board towards the beach. While pushing on your tail be sure that your body is centred over your board, and your centre of gravity is low. As your spinning look down over your toe side rail to spot your landing. Focus on where you are going to land for the rest of the spin. Bend your knees and keep your tail a bit higher than your nose so you don't tail dive. Stomp the landing. Try to land with your tail pointing straight into shore, and your wait centred over your front foot. Your feet will most likely be a little farther forward than usual so look over your shoulder (the one farthest from the beach) to finish the trick and get your nose pointed back towards the beach. If you land over your fins your board will want to keep spinning so just let it spin while keeping low and centered. Once the spin is complete look for the next section and try to hit the lip. 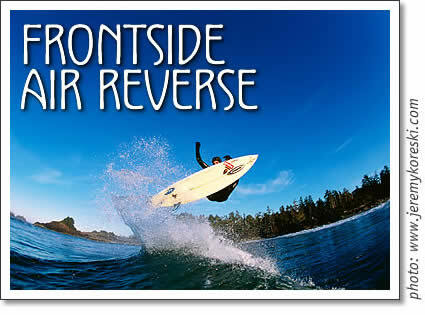 Frontside air reverses are a great trick that can lead you away from basic maneuvers into the future of surfing. Get a video of Taj Burrow and put it in slow motion if you want to learn this trick properly. He's got these wired. Peter Devries grew up in Tofino and has been in surf competitions since he was 14. Tofino surf school: Tofino surfer Peter Devries explains the 'Frontside Air Reverse', an advanced surfing move.